From his new series Kaiju Manga ( Pictures of Magical Animals), #1, Godzilla and the Fox, printed in an edition of 40. Paper size 21.5 x 29.5 cm. 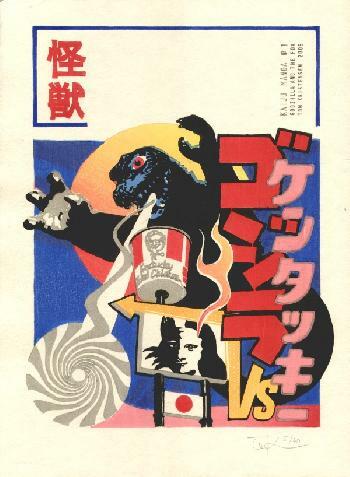 Tom Kristensen has added: "The traumatic transformation of post-war Japan is symbolised by Godzilla, half whale and half gorilla. Godzilla is a radioactive mutant born to battle a confusion of culture, old and new, East and West."